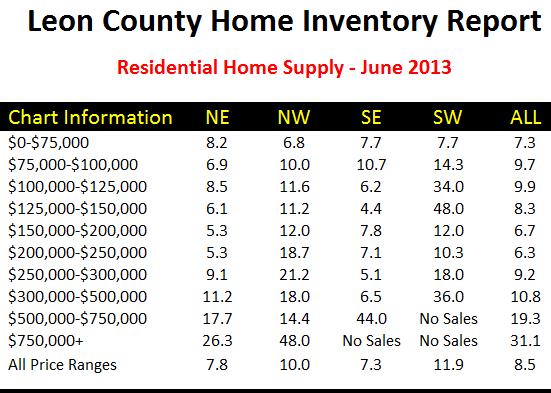 Both the real and relative supply of homes for sale in Tallahassee are experiencing the normal rise that occurs at the beginning of the spring each year. The 2,065 homes listed for sale in the Tallahassee MLS represent 11.3 months of supply, which represents a rise from the 1,988 (and 10.9 months of supply) that were recorded last month. 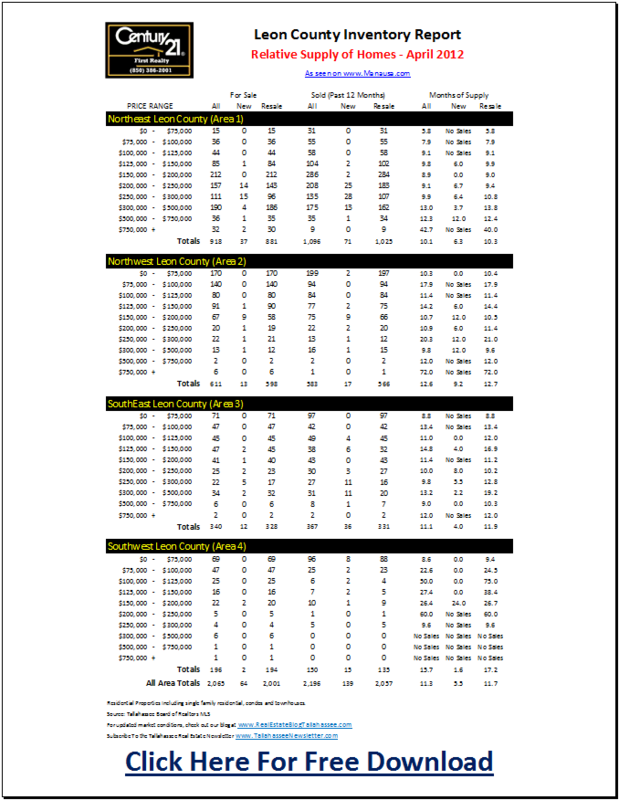 This month's Tallahassee Housing Report shows typical spring growth in the real and relative supply of homes available. Four years ago, there were 3,192 homes on the market in Leon County, which means the real supply has dropped 35%, but still needs to drop considerably more to meet the expectations of home buyers. The real supply of homes is still significantly higher than what we saw prior to the boom years of 2002 to 2006, and the relative supply of homes (the amount of homes for sale in Tallahassee measured at the current rate of demand, report in months of supply) is still far too high and growing. The real estate graph below shows that the relative supply of homes (blue bars) and the real supply of homes (red boxes) are both on the rise. This is not surprising, as it normally occurs this time of year when the bulk of new listings enter the market. The orange "Market Equilibrium" line shows where the blue bars need to be for the market to have a normal relationship between supply and demand. It is at that level that we traditionally see a 3% to 4% rate of real estate appreciation. The real estate graph below measures the supply of homes available each month as well as the percentage of homes that sold compared to gross supply figures. The yellow band represents a balanced turnover rate in the 5 to 6 months of supply, and we observe the red line never makes it to this balanced or "normal" range. For our real estate market to experience equilibrium between the supply of homes for sale and the current rate of demand, we would expect that red line to be above and below the yellow band, not just consistently below it. It would be nice to have seen the red line hit "normal" at least once in the past 5 years, but that just goes to show how bad our housing imbalance really is. 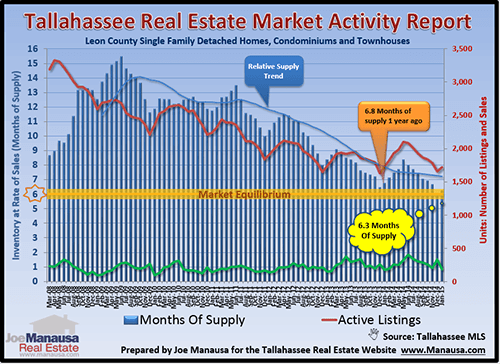 We will continue to monitor real estate supply and demand in Tallahassee, and you should check back here regularly to see when we finally report a real reduction in the relative supply of homes for sale.